The following list reflects who's hot and who's not in the search for John McCain's vice presidential running mate. It is compiled by CBSNews.com senior political editor Vaughn Ververs and the rest of the CBSNews.com political team and reflects media speculation, buzz, reporting and a lot of guesswork. This list will be updated as conditions warrant. Up and down over the course of the past several weeks, the former McCain adversary from the primaries re-takes the top spot in the Hot Sheet almost by default. Romney appears to be shaping up as the default candidate after trial balloons about others get swiftly shot down by Republican activists. But the Obama effort to portray McCain as wealthy and out of touch might hit a little too close to home to make this former venture capitalist make sense. If McCain goes with someone with whom he has a strong personal relationship, Pawlenty could be high on the list. Conservatives seem content with him and he'd surely get a warm welcome when the convention kicks off in his home state. Still, questions remain about whether the relatively unknown governor, who only recently trimmed his Minnesotan mullet in favor of a more neutral hairstyle, is ready for the national stage. It would be history-making in more ways than one if McCain chose a former vice presidential candidate from the opposing party to be his running mate. Lieberman's support of abortion rights, not to mention his long, Democratic voting record would risk organized chaos at the GOP convention next week and outrage among vocal conservatives like Rush Limbaugh. But reports are that McCain is seriously considering this unlikely choice, moving Lieberman up the charts. McCain set off alarm bells among conservatives when he said that he wouldn't disqualify someone who favored some abortion rights from being on the ticket - a comment widely viewed as referring to Ridge, who McCain is close to personally. The former Pennsylvania Governor has the kind of experience McCain may be looking for and the Keystone state would be a plum battleground state. But the reaction to this trial balloon may have been enough to deflate it for good. At first glance, the Florida governor is making all the right moves: he's ending his bachelorhood, reversing his position on offshore drilling and saying nice things about Sen. McCain in public. Picking the popular governor may be enough to nail down a crucial state. But Crist may also be in danger of giving off the appearance of trying too hard to get the job-a potentially significant liability. Revelations that the Virginia Congressman has been asked to provide personal information to the campaign vaulted Cantor from relative obscurity to near the top of the list. He's popular among conservatives McCain would like to solidify heading into his convention and, at 45, would bring some youthful exuberance to the ticket. But picking Cantor would require a huge introductory effort and the buzz around him feels a little like reaction to the Tim Kaine boomlet on the Democratic side. The Alaska state legislature voted to hire an independent investigator to look into whether Palin abused her office in trying to get a state employee fired for personal reasons. Potential scandals are never good things to have hanging over your running mate's head, but the Alaska governor has generated serious buzz in conservative circles. The McCain campaign would dearly love to have something to offer those women voters who backed Hillary Clinton and who feel that the nomination was unfairly taken away from her. Fiorina could do that and, as the former CEO of Hewlett-Packard, also bring some business heft to the ticket. She's become one of the campaign's most active surrogates on the TV talk show circuit but is untested. Her recent complaint that health care plans cover Viagra but not birth control demonstrates the importance of the kind of discipline she appears not to have mastered yet. The Louisiana Governor has all-but taken himself out of consideration but remains on the list as a reminder of how far his prospects have fallen. When the vice presidential watch began in earnest earlier this summer, Jindal was one of the favorites, both of conservatives and campaign watchers. His record and reputation as a wunderkind of policy may not be enough to overcome his youth, which could be an unwelcome contrast to McCain. The South Dakota Senator revealed this week that he was not formally vetted by the campaign, all-but putting an end to his VP prospects. Thune was seen as a choice that would have satisfied conservatives while bringing a younger presence to the ticket. Thune is an up-and-coming star of the Republican Party, however, and it's doubtful this will be the last list he's on in the future. 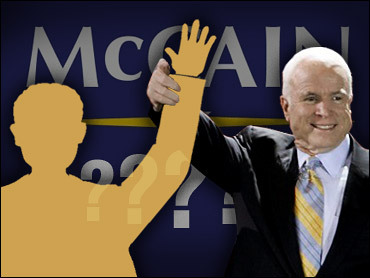 Who is your pick for McCain's running mate?